Over the years, my beauty routine has become simpler and simpler. I rarely wear makeup these days, and when I do, I am much more conscious about what I put on my skin (the days of cheap concealers and questionable lipsticks are forever gone). I am a firm believer in the power of proactive health, as the habits I form today, will likely impact how I look and feel 40 years from now. At that time, I will be 70 years old and if all goes well, my skin’s complexion will not match my age. We are all aware of how our lifestyles impact our skin and overall health, but would you ever think about using coffee and sugar during your beauty regimen? What may sound like an odd combination outside of your favorite morning mug is actually an ideal beauty solution. Here’s how you can begin utilizing this unexpected combo to achieve real results. Coffee boasts health benefits for your skin too. Let’s begin with that one ingredient we can’t seem to live without — coffee. When you source a quality coffee, you can actually benefit from a wide range of health and beauty benefits. 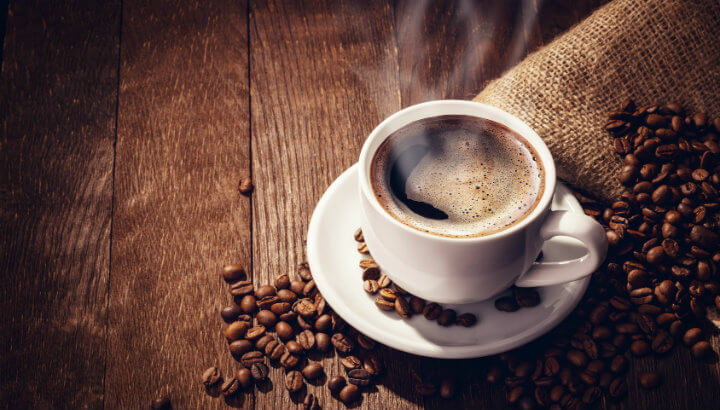 It all starts with coffee’s antioxidant content helping your body combat free radicals, which are what lead to signs of aging (think wrinkles and a loss of skin elasticity). On top of the antioxidants found in coffee, you can also benefit from potent anti-inflammatory properties. This is due to compounds known as polyphenols, which act as a natural defense system in plants. In terms of your skin, this can help you combat and soothe breakouts, while reducing the appearance of dark eye circles. Now, sugar offers fewer immediate health benefits in terms of its properties. However, that does not mean that sugar is not a useful beauty tool. In fact, it’s one of the most effective (yet inexpensive) options in your pantry. Acting as a natural exfoliator, sugar can remove dead skin, promoting a natural, healthy glow. Whether you are looking to improve your skin’s complexion or apply a chemical-free hair treatment, coffee and sugar have your back. The following combinations will elevate your beauty routine, allowing you to reduce your exposure to toxins (all while saving a bit of extra cash). If you are interested in combatting dry skin, while buffing fine lines, a coffee scrub will do the trick. As you support the natural removal of dead skin cells, you will support your body’s renewal process. Make way for new skin cells — it’s time to glow! Coffee and sugar can give you a shining complexion. To make: Simply combine three tablespoons of ground coffee with one tablespoon brown sugar, before adding one tablespoon olive oil. When you reach your desired consistency, gently massage the scrub on your face, then rinse with warm water. When you look at the ingredients in most hair treatments, there are many questionable ingredients — both for you and the environment. If you’d like to renew your hair and make it shiny as can be, all you need is a touch of coffee and some water. If you want to incorporate sugar, you can make more of a scalp exfoliator before applying the recipe below. To make: In order to help your hair shine (while supporting healthier hair follicles), simply combine strong brewed coffee with a touch of water. Once the mixture has cooled, it’s time to apply. You can either pour it over your hair while leaning over the tub, or you can put it into a spray bottle and spritz it on. Apply a shower cap, wait 20 minutes and rinse. Coffee and sugar: more than just a morning beverage. Incredibly common, cellulite affects around 90 percent of women and 10 percent of men. As you benefit your skin’s natural glow, a coffee-sugar body scrub will also diminish the appearance of cellulite. It is believed that coffee can actively dilate blood vessels, reducing the appearance of your pesky skin dimples. 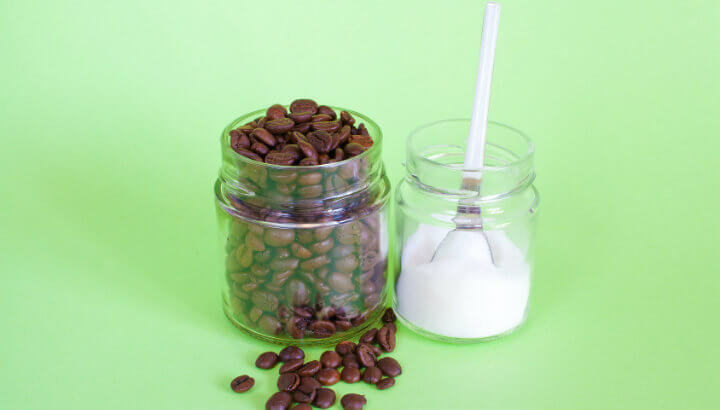 To make: Combine equal parts coffee and coconut oil (approximately one cup each), along with a ½ cup of sugar. After you have washed your body, massage your scrub onto problematic areas for approximately one minute, then rinse. Our poor feet do a whole lot of walking, so they need a little love. Plus, exfoliating the bottom of your feet is a treat in itself. As you scrub away dead skin, your feet will be smooth and summer-ready! 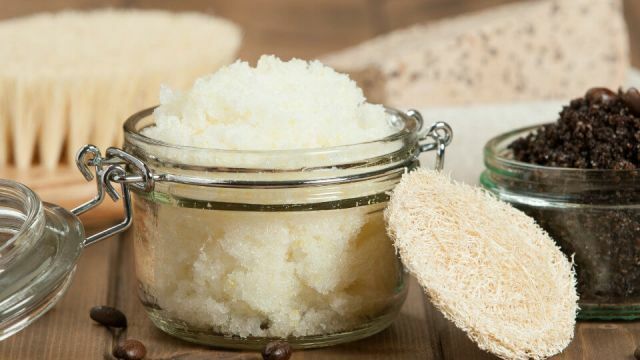 This scrub is more abrasive than your face scrub, so be sure to only apply this combo to your hands and feet. Make a foot scrub with coffee and sugar. To make: Combine a ½ cup of dry coffee grounds with one cup of raw sugar. Then add ½ a cup of almond oil plus five to six drops of essential oil (tea tree offers great anti-fungal properties while lavender promotes healing). Simply apply the mixture to your feet, working in a circular motion before rinsing and patting dry. So, the next time you’re drinking your morning cup of Joe, take a look inside your mug. That rich, black liquid we all love can now be applied to your skin and hair. As you actively practice more and more chemical-free DIY remedies, you’ll wonder why you were spending a fortune on products that often do more harm than good. It’s time to switch up your beauty routine. After all, 60 percent of what goes onto your skin will end up in your bloodstream. Transition to a chemical-free lifestyle — your body and the planet will thank you for it. 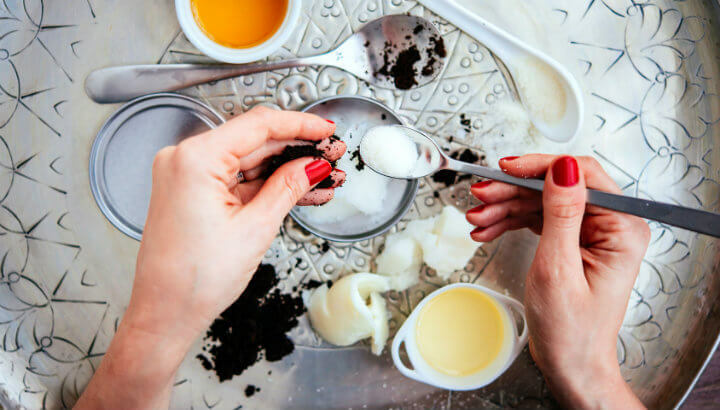 Hey Buddy!, I found this information for you: "4 Ways To Combine Coffee And Sugar During Your Beauty Routine". Here is the website link: https://www.thealternativedaily.com/4-ways-to-combine-coffee-and-sugar-during-your-beauty-routine/. Thank you.